From Anna of the Five Towns to Badger, the TV themes on this album span fifteen years of composing music for that small screen in the corner of the living room. The brief from each producer is nearly always the same: music is needed to give the programme an identity, a feel, to tell us where we are and who we are with - a tune that will bring us in from making tea in the kitchen, a sound that tells us our favourite programme has just started. Sometimes the location sparks ideas: the brass band cornet for Hetty Wainthropp Investigates, the Northumbrian pipes for Badger and, inevitably, the piano accordion for Maigret, whose producer stressed the importance of music that was quintessentially Parisian. The series had actually been shot in Budapest, and, I quote, 'if the audience don't think we're in Paris we're dead'. Sometimes the period of the drama is a springboard to a certain style, inspiring the jauntiness of Campion or the dance band for Just William. The route to this television work came via the Footlights Revue Company at Cambridge, conducting musicals in the West End and composing twenty scores for the Royal Shakespeare Company. Techniques learnt in the theatre are invaluable when applied to scoring music for film. On this CD you are hearing twenty-seven title themes, but for every one of these about twenty minutes of incidental music for each individual episode of a series will have been composed in addition to the opening and closing music. In other words, music specially written for a six-part drama series, if played continuously, would last as long as a couple of Mahler symphonies. This 'incidental' scoring is the music you do not notice, but it is often telling you how to feel or how to react to a dramatic scene - in other words, it is pure theatre, and the composer has to respond to the images in a way which enhances the drama. Sometimes the music can take on a life of its own away from the programme for which it was originally written. The theme from The One Game, which was issued as a single, became a popular radio hit. The session singers who sang on the original soundtrack called themselves Chameleon. Due to their success I wrote an album for them, and a new group was formed! They can also be heard on Summer's Lease, and their lead vocalist Olive Simpson sings solo on Maigret, Chimera and An Affair in Mind. The BBC family drama series Growing Pains featured a lead character who was mad about old film musicals, so I created a theme song that could have been sung by Fred Astaire in his RKO days. We even go as far as to make the start of the track sound like an old 78 rpm record - courtesy of 'eggs and bacon' recorded from a blank shellac disc, then mixed on to the track via digital tape! Talking of chameleons, that is exactly what today's television composers need to be. With the best will in the world you cannot score a romantic historical drama like A Woman of Substance in the same way you would compose a theme song for comedy duo Cannon and Ball (one of my earliest efforts which somehow did not find its way into this collection). From Mozart pastiche to rock and roll, from a pub band to a full symphony orchestra (with choir), the TV composer has to switch styles, instruments, and even centuries, effortlessly and convincingly. And if the music works well - if it blends searmlessly into the drama - it will largely go unnoticed and unsung. The reward, of course, is being part of a team which brings all the creative elements of a production together into one complete entertainment. 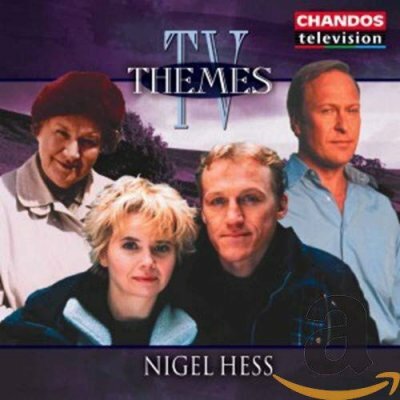 "As illustrated by the twenty-seven themes featured on this CD, Nigel Hess is one of the most successful writers of British television music working today, and at nearly eighty minutes this release from Chandos Television represents excellent value for money. Sound and presentation are excellent, as are the composer's booklet notes."